All photos by Peter Wesley Brown. See more on his Flickr album. Andria Mitsakos' first trip to Mykonos last year was so incredible she decided to spend this summer on the island. And what do you know: Laptops and business can mix with beaches and boat rides. MYKONOS, Greece – My best week last summer was spent on Mykonos. I'm a Greek-American who has spent her life shuttling around the globe, continually touching down in Greece — with my parents when I was a kid to do the must-sees, with a boyfriend-at-the-time for a Santorini sojourn — but I had never been to this Cycladic paradise. Now it's a summer ritual. The 39 rooms and suites are all different and have been decorated by famous artists and local craftsmen. (I've slept in every one.) They're tucked away in a villa environment with paths that wind their way down through leafy grounds and flower gardens past a freshwater pool ad chapel to a saltwater pool, the Pirate restaurant, and swim-up bar where award-winning mixologist George Akalyptos serves special shots of the day. One of the owners spins music and lunch typically goes late. There's a gorgeous, private beach a few steps below the main pool deck and day beds abound. Bare feet and bikinis are on order for the entire trip. If I didn't stay here, I'd go to , a small, 31-room boutique hotel close to the port high above Agios Stefanos beach. 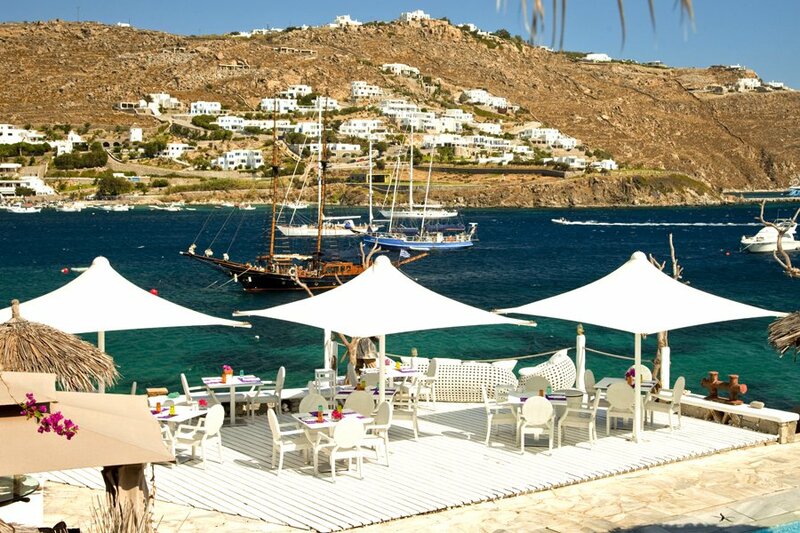 The style is contemporary coastal cool-meets-Aegean beach-side seclusion. Heaven. When I want a "weekend in the city," I check in to , a 1960s Palm Springs-chic hotel just behind Mykonos town's famous windmills. This is the place to stay if you're on the island for the early morning clubbing, as walking to your room is a dream when you look down at your Blackberry to find it's suddenly 7 a.m.
Agios Konstantinos. Don't you wish you were here? And I'm partying like it's 1812. Kivotos has a six-passenger charter yacht whose history you'll retell over dinner parties all winter long. was one of the fastest ships of the War of 1812. In 1814, she was chased 17 times by the British navy and outran them every time. She was eventually sent to England for copying after being taken in a gale storm. Built in 1967 in Holland and fully rebuilt in 2008 in Greek shipyards, it can be chartered day, overnight, or three- and seven-day trips. Yes, Mykonos has lots of Ibiza-type beaches if you want the thumping music scene. Also lovely is Agios Konstantinos. It's just beneath and is usually deserted. 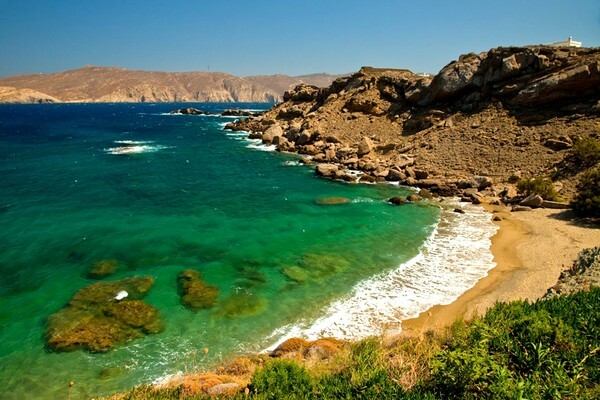 Other great beaches: the amazing Fokos (don't bother bringing a swimsuit if you're so inclined), site of the great . I love Ftelia beach and the superb restaurant there, Stelia. When you go to Kapari near Agios Ioannis, make sure you wear something on your feet. flies non-stop from Athens; flies from London and other Euro capitals; and a runs from Piraeus. My preferred mode of transport is by helicopter or single-engine Cherokee with Thanos Iordanis's company . Having a schedule in Mykonos is an anathema.